Late check out (after 11:00 and before 03:00) may result in a fee. At the Crash Hotel we accept all major credit cards. A valid bank issued credit card and photo identification is needed at check in for pre-authorization. We pre-authorize your card for the value of your stay plus $50.00 per day for any incidentals. We do not accept cash deposits, debit cards or pre paid credit cards at check in. Cancellation Policy : 4:00 PM day before arrival or forfeit one night room and tax. For our allergy suffering guests, we do not allow pets to stay in the hotel. Service animals are welcome. We have a fantastic downtown location that doesn’t include parking. We are a 110% non-smoking hotel. The fee for smoking in your guestroom is $500 + taxes… so don’t. All rates are based on double occupancy. Threesomes will cost you an extra $20. Guests 17 years and under stay free with existing bedding and an adult in the room. Fitness Facilities, see the front desk for access to the YMCA or World Fitness. 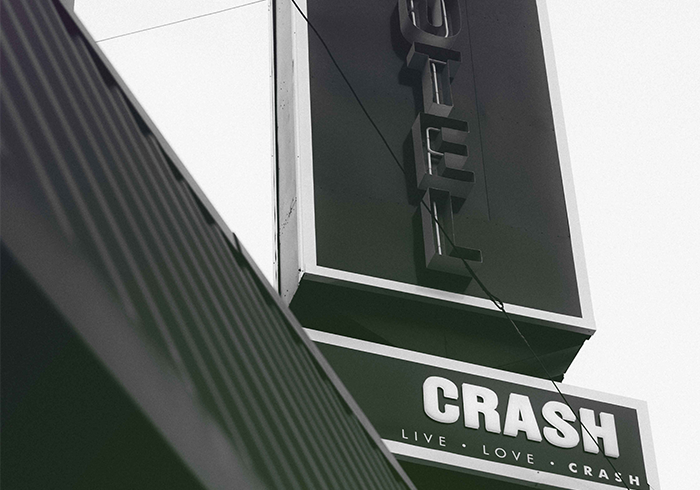 Situated in the heart of the Edmonton Downtown core, Crash Hotel is one of the trendiest, busiest, and all round unique experiences in the Edmonton downtown core. With unique themed rooms and a lobby that can indulge in any desire you have - we are the place to Crash Land on your next trip to Edmonton.